Opture SBP software is currently the most advanced simulation software for calculating fluctuation-/bandwidths and sensitivities for complete P&L and cash flow statements. In times of extreme economic fluctuations and volatile markets, conventional business planning (-> so-called one-point planning) is no longer sufficient. Only by considering uncertainties it can be shown how robust a company and/or how sensitive the planning actually is against market changes. Understanding about the stability of planning has become an indispensable prerequisite for the optimal and value-oriented management of a company. 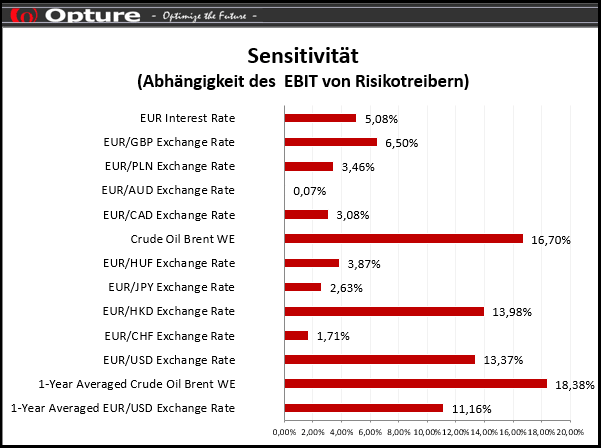 Additional to a risk-adjusted PnL and calculating sensitivities, Opture SBP also calculates the influence of market factors on key risk indicators (KRI). 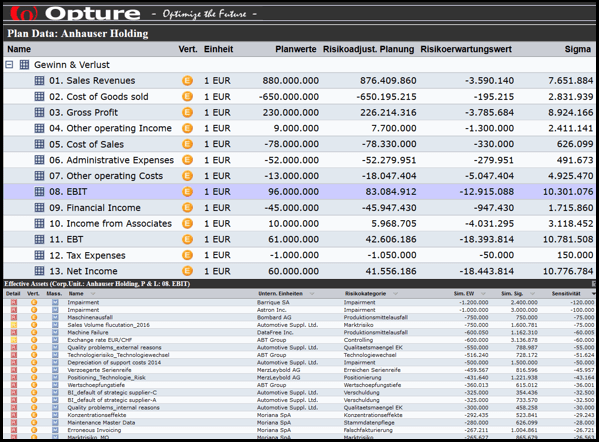 Opture SBP calculates the bandwidths (-> sigma) for all items in a complete profit and loss statement. High sigma values indicate large fluctuations. Opture SBP analyzes where the large simga values come from. The calculated sima values and/or standard deviations define the breadth of a distribution function which, in turn, represents the risk and extent of future uncertainties. The wider, the more uncertain. 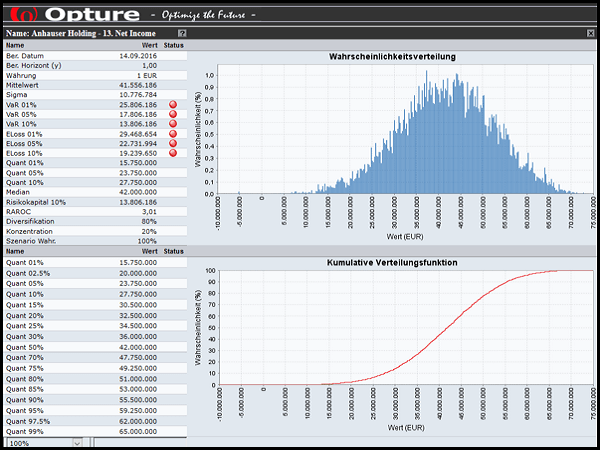 In addition to the fluctuation margins, the Opture SBP software also calculates the sensitivities that indicate how stable and/or robust the planning and the company are against market fluctuations. 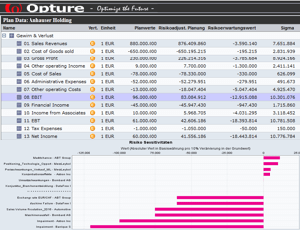 The Opture SBP software results consider the uncertainties of the future within the operational and strategic planning. With the help of sensitivities and sigma values, the stability of the planning can be determined against volatilities in the market. Using individual stress tests the effects of extreme market scenarios on planning can be calculated. The planning data, as reference values for the calculations, can be imported into the software via upload or via interface. In the Opture SBP software the bandwidths can be calculated via any consolidation levels (from single risk up to holding level). In Opture SBP the market factors and their influence on the planning are continuously calculated and monitored.